Portable and compact, the HP2 gives you all you need to drive your headphones or in-ears without complicating your setup. 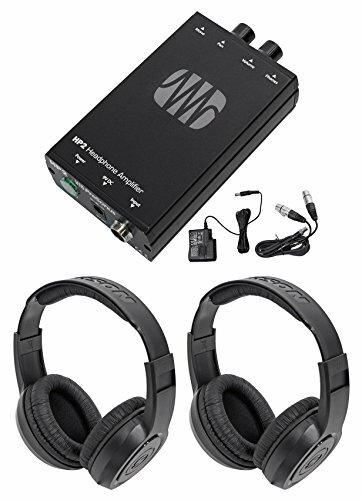 It sports two XLR line-level inputs and one stereo 1/8-inch headphone output with volume control. Operation can be switched between stereo and mono, and a Pan knob is provided. Like all PreSonus gear, it's built to take the rigors of life on the road. And it mounts on a microphone stand or clips to your belt. Dimensions (HxDxW) 1.25" x 2.875" x 5.25"
When you're playing an extra long show or two shows back-to-back, having to stop and change batteries on your headphone amp is a hassle you don't need. No worries! HP2 stands for "Has Power 2 Spare." The HP2 can be powered with an external DC power supply or a nine-volt battery that lasts more than seven hours and includes an LED battery indicator. So you can play those extra-long gigs and hear your monitor mix perfectly-all night long. Presonus HP2 2 Channel Stereo Headphone Amplifier System HP-2. Battery-powered, stereo headphone amplifier. Volume control knob. Pan control knob. Stereo/mono operation switch. Battery-health LED indicators. Belt clip. Inputs: 2 female XLR connectors. Output: stereo, 1/8" phone connector. 2m cable (5-pin mini XLR to 2 female XLRs) included. 9V battery or DC power supply. 5/8-inch (27 tpi) microphone stand-mount socket. Dimensions (HxDxW) 1.25" x 2.875" x 5.25".